Line a 9-in. square pan with foil; grease foil with 1-1/2 teaspoons butter. In a heavy saucepan, combine sugar, sour cream and remaining butter. Bring to a boil over medium heat, stirring constantly. Cook and stir until a candy thermometer reads 234° (soft-ball stage), about 5-1/2 minutes. Remove from heat. Stir in chocolate until melted. Stir in marshmallow creme until blended. 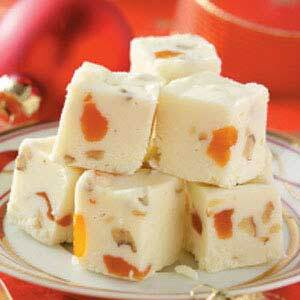 Stir in apricots and walnuts. Immediately spread into prepared pan. Refrigerate, covered, overnight. Using foil, lift fudge out of pan. Remove foil; cut fudge into 1-in. squares. Makes about 2 pounds (81 pieces).